A watered-down version of the original K5 (play editions are usually less ambitious than their base models), the Lenovo K5 play comes with a couple more cons than its mother model, but it targets the same mid-range smartphone clientele. One of the key differences between the K5 play and the original is that this version now runs on a middling 1.4GHz eight-core Qualcomm Snapdragon 430 (MSM8937) processor -- not that the K5 is a whole lot better with its 1.5GHz eight-core engine, but it is still a downgrade at the of the day. As of this specs-based review, many of its octa-core rivals use processors clocked at 2GHz or higher. At the very least, this play edition retains the K5's 3GB RAM count, although it also has a 2GB-only variant for not-so-demanding users. Display-wise, both the K5 and the K5 play are basically identical, rocking 5.7-inch displays with wide 18:9 aspect ratios , just like many models in this Phonerated list of the best phablets. Sadly, the K5 play also suffers from a 720p-only resolution , while a good number of other 2018 middle-class Androids at least come 1080p qualities. Also, it apparently does not come with the K5's back-to-back 2.5D glass protection , but it does don what Lenovo calls an S texture glare design , adding a sprinkle of sophistication, at least in terms of physical pros and cons. As for imaging, the K5 play resembles many photography-first smartphones by sporting a 13- plus 2-megapixel dual-lens main camera enabled for background blurring or Bokeh shots . 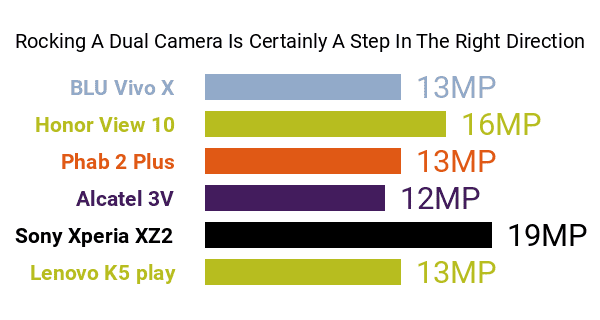 Note, though, that its 2-megapixel depth cam is a downgrade over the original K5's 5-megapixel one , although, seeing that the K5 only captures HD-720p videos at best, the K5 play's Full HD (1080p) maximum video recording resolution nicely balances things out. Up front, the K5 play features a tolerable 8-megapixel f/2.0 selfie camera, although a front-firing LED flash and an autofocus feature (It comes with a fixed-focus capacity), which were no longer uncommon around the time it entered the mid-end Android market, would have been nice . Joining its aforementioned CPU and RAM in the engine room is a respectable 3000mAh battery , while a 32GB/16GB internal memory expandable by up to 128GB is on storage duties. The K5 play is offered in Jazz Blue, Modern Gold, and Punk Black. 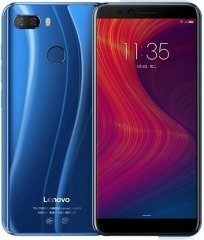 Summing up, with the pros and cons that it brings to the table, the Lenovo K5 play sounds like a viable choice for mid-level shoppers looking for a wide-screen, dual-cam-equipped smartphone.